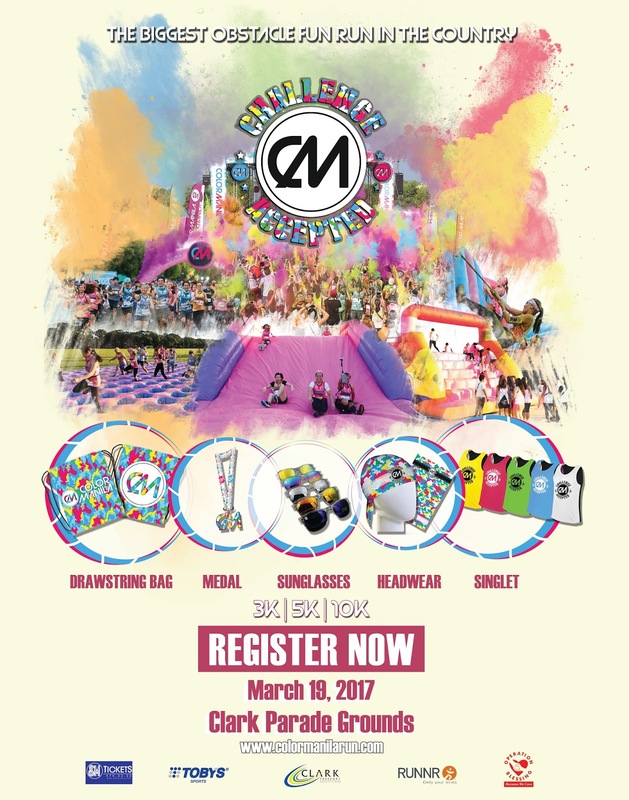 26th of February 2017 - MANILA, PHILIPPINES: COLOR MANILA, currently the most aggressive ‘concept fun-run’ organizer in the country today, is setting its sights on its next big event at Clark, Pampanga on March 19, 2017. The last event of COLOR MANILA at Clark, Pampanga saw a sold-out event with 6,000 participants. The upcoming CM Challenge Run, which will be held at the Clark Parade Grounds, will have the runners this time go through obstacles, color stations and mazes. 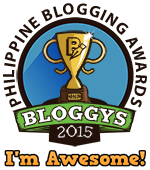 “The last time we were at Clark, we saw participants from nearby provinces such as La Union, Baguio, Bulacan, Nueva Ecija and Tarlac. We also had some foreigners from other Asian countries and the United States who flew in just for that run. We would like to consistently do this, along with our local partners, such as Clark Development Corporation, so we can help in our own way, in terms of growing the sports tourism agenda of Clark, Pampanga”, says Cordero. Participants can choose between the Deluxe Kit and the Trooper Kit. The Deluxe, which is at Php 650 includes the singlet, sunglasses and color packet. While the Trooper Kit, which is priced at Php 1,050, comes with an added drawstring bag and headwear. Runners can also choose between the 3K, 5K or 10K routes. Sponsors for the CM Challenge Run include Clark Freeport Philippines, Toby’s Sports, Runner, Anytime Fitness Angeles, Pascual, 100 Plus, Starbucks Coffee, SM Tickets and Runnr. 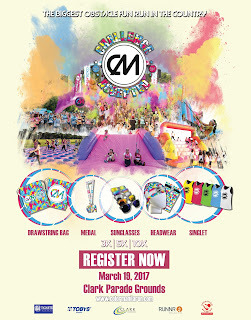 Registration is still ongoing at www.colormanilarun.com.